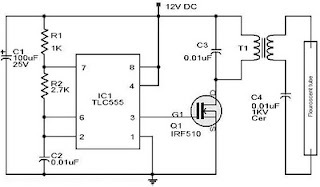 Emergency Light With 555IC is one of the solutions for lighting during power outages. With the Emergency lamp series, 555IC uses 12VDC source voltage that can be supplied by a 12V battery. 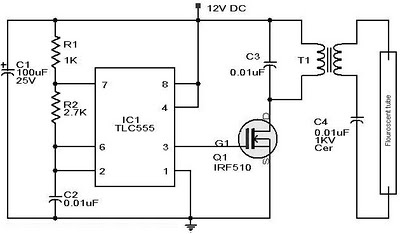 Emergency Light Series 555 IC With this very simple and easy to do, because all the components are easily available in the market. Emergency lamp series with this 555 may include a light 5W-10W. The circuit is built with an unstable multivibrator IC 555, which is used to the mendrive transformer through Q1. More information can be viewed directly from a series of the emergency lamp 555 follows. 0 Response to "Emergency Light Circuit by Using With 555IC"